In just a few more days, the seemingly-endless wait for Siralim 3 will come to an end and you’ll be able to play the game in Early Access on Steam! As any Siralim veteran knows, one of the first things you’ll do in the game is choose your characters’ class, which also determines the creature you’ll start with. I’ve decided to reveal these creatures ahead of the game’s release so you can figure out what class you want to use. I’m very happy with how all 5 classes turned out, and I think players will find that all of the starting creatures are both fun and powerful in their own ways. Enough talk – let’s get on with it! 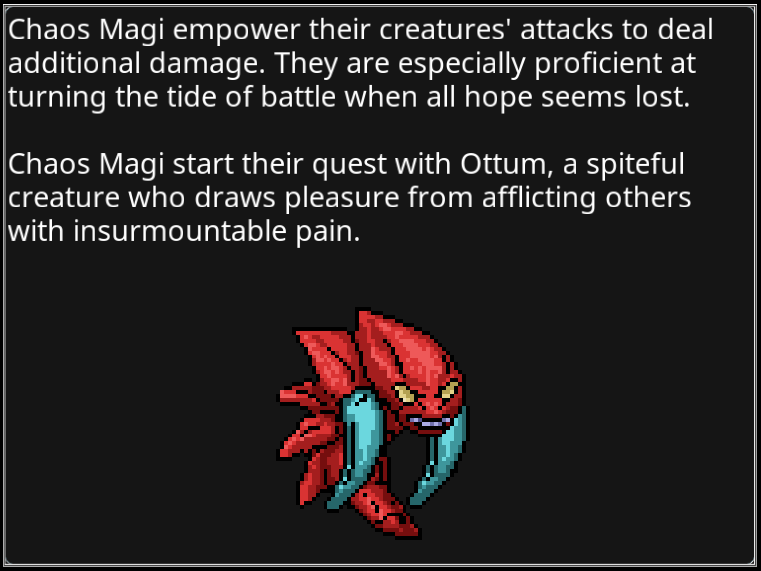 Ottum has the “Elimination Process” trait, which does the following: After this creature attacks, it attacks a random enemy 2 times. These extra attacks deal 50% normal damage. 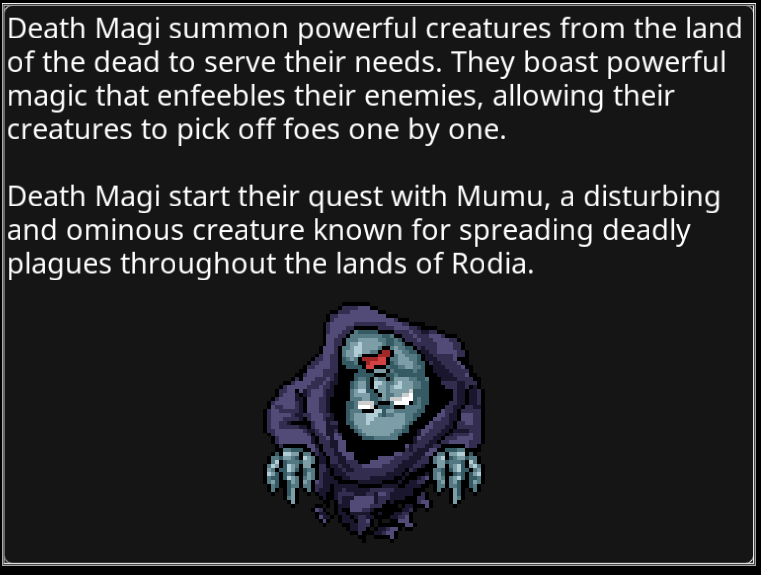 Mumu has the “Revolt” trait, which does the following: After this creature attacks or is attacked, it afflicts the enemy with a random debuff. 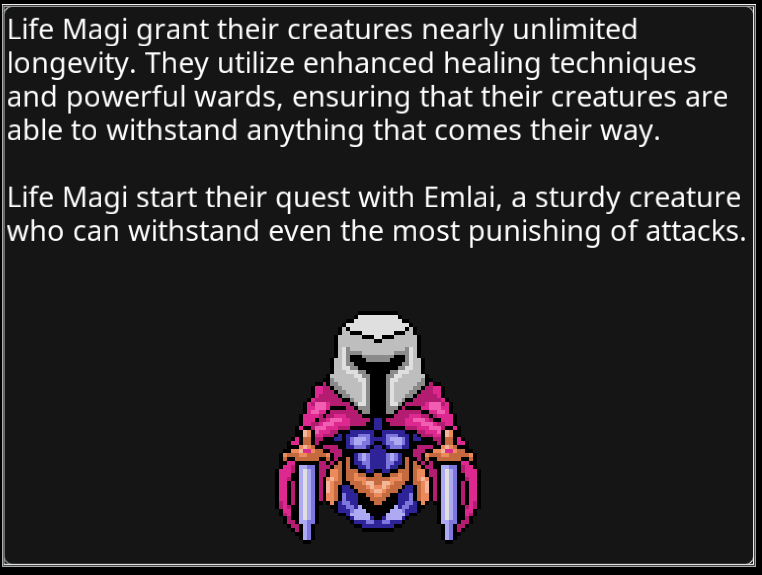 Emlai has the “Release the Cure” trait, which does the following: After this creature attacks or casts a spell, it recovers 25% of its missing Health. 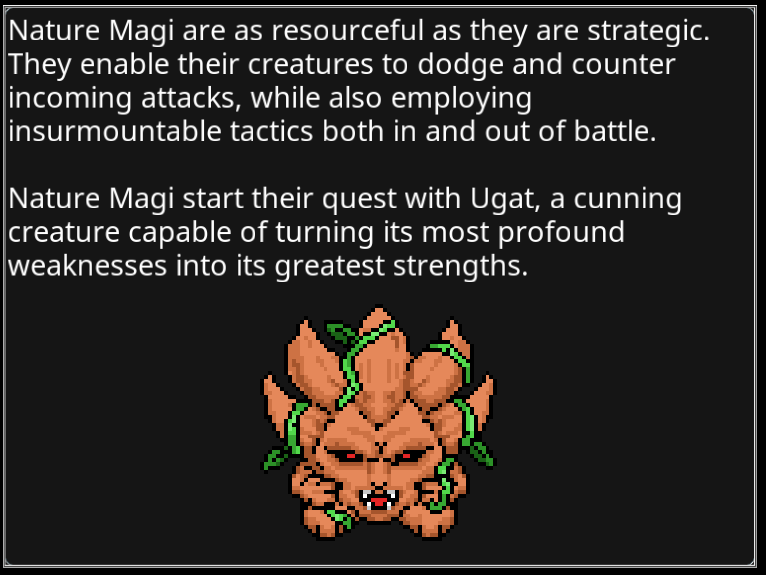 Ugat has the “Karma” trait, which does the following: After this creature attacks or is attacked, it gains 35% of its lowest stat. 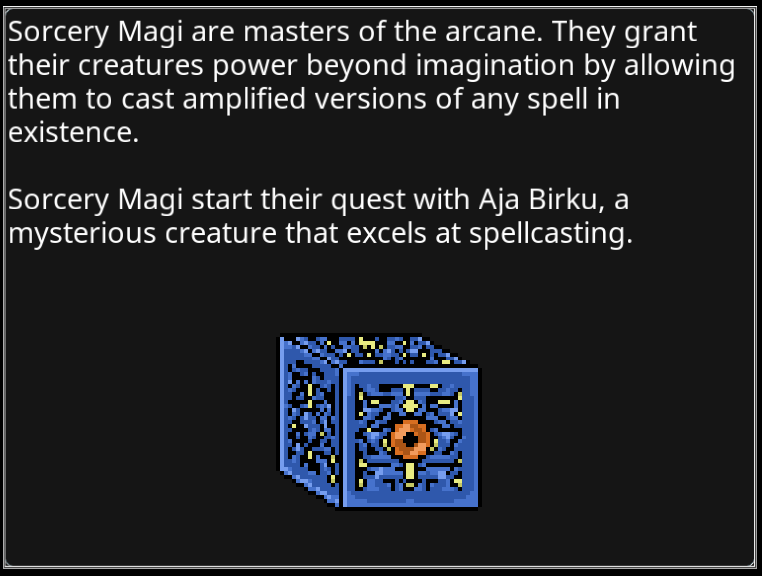 Aja Birku has the “Dimensions” trait, which does the following: After this creature manually casts a spell, it casts another random spell that belongs to the same class. Each class’ starting creature intentionally synergizes with that class’ respective perks. The goal for each starting creature is to give you some immediate idea about the playstyle of each class. In addition, you’ll receive a second creature during the game’s tutorial, and each of those creatures was carefully-selected to synergize with your primary starting creature as well. Which class do you plan to play first? Excited! Starting creatures look awesome! Death Magi for me! Looks great! Can’t wait. It’s Life Magi for me. I will buy it for Steam and double dip for Switch. Nature Magi as always! Loving the new creatures! Nature all the way! Also I was under the impression that there was going to be no new creatures, but rather focusing and polishing the ones that already existed. Will there be more new creatures? Either way I can’t wait to play early access! Oooh, so cool!! I want them all… But if I have to choose one of them, Emlai will be mine! Can´t whait to build an team with endless triggering healing abilities! Do these creatures belong to families or are they single, unique beings? They belong to a new race called “Godspawn”. Your opponent grins. He has the upper hand so far. You still have a bit of energy left, but that’s your last shot. What will you do? 1) Conjure a handful of sharp needles with high velocity. Hard to to time and aim them right, but if it hits victory is as good as yours. 2) Focus everything you got to discharge on your foe’s nervous system. It should slow him down considerably for a short time. 3) Spread your power thorough your body to heal your wounds. A second chance of sort but now you know what the enemy is up to, time for round 2! 4) You are at a disadvantage of raw power in an otherwise quite close battle. Call after a bear spirit to turn the table around. 5) Unleach all you have left in one powerful bolt of pure magic. Answering my own comment, I’m not actually a fan. I’d rather get what I can see. But it’s fun to think about. It feels quite close to Magic the Gathering color scheme. Respectively red, black, white, green and blue. Is that a coincidence or an inspiration? Always thought MtG has a great design on that part. Sounds awesome! I usually play Death, but I might try Chaos this time. We’ll see… either way I’m looking forward to playing! Siralim 3 enters Early Access on May 25, 2018! Siralim 3 has entered Early Access on Steam!